If you've ever fancied a stylus and a 5-inch phablet but don't want to pay top-end prices then Alcatel's new One Touch Scribe range is hoping to give you new option. 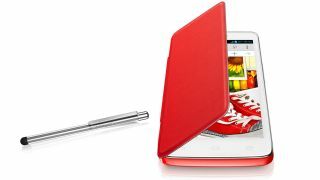 The Chinese giant is offering up MWC 2013 the already-shown-off Scribe HD and the One Touch Scribe Easy, complete with Android Jelly Bean and a touch pen, in a range of colours that include Flash Red, Fresh Blue, Pure White and, err, Flash Yellow. The Android 4.1 toting Alcatel One Touch Scribe Easy brings a 5-inch WVGA screen, a dual-core 1.2GHz processor, magnetic cover and oil resistant screen to keep you smear free. The higher end One Touch Scribe HD brings 3G+ connectivity, a 5 inch 720p screen, a quad-core 1.2GHz processor and that MagicFlip magnetic cover. Also on board are an 8MP camera, front facing HD camera and Android 4.2 - and the awesomely-named Dragontail glass for your display. The prices are not yet announced, but expect them to be competitive. The Easy has a launch date of March, with the Scribe HD 'penned' in for April.